Flowers While We’re Living , presented by Unit 2 and Ninkuru Zinduru as a part of the 2017 Queer Pride Festival, had a glorious one night showing at Buddies in Bad Times Theatre. 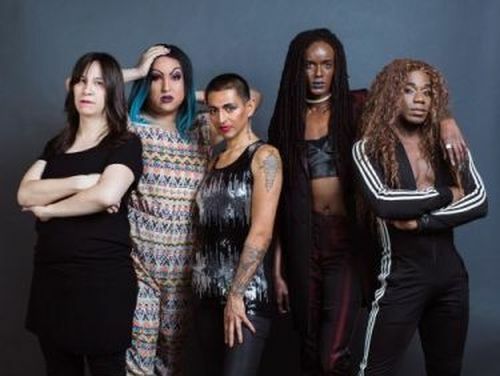 It was a beautiful, vulnerable performance by incredibly talented trans people of colour. I was very grateful to have been given the chance to attend such a moving piece of work, especially as a part of a sold out house! The show consisted of seven performers sharing their art and magic with the audience through short acts. These acts were connected by DJ Dirty Dabz’ gorgeously fitting mixes. She also played the audience into and out of the theatre. The music really added to the experience as a whole; it kept the show moving forward. The performers ranged from Ravyn Wngz, whose bravery was displayed through evocative song and dance, to alaska B, who’s musical eloquence flowed effortlessly through her drumsticks. My personal favourite performer was Caroline Brown. She had a very serene stage presence, and both her song and her words had me in tears at times. I also adored the spoken word performance by Kama La Mackerel. She is obviously a master of her medium; not a single word felt out of place and her performance was emotional without being overly show-y. She recounted the story of coming out to her mother as trans with such poignancy that I closed my eyes at one point and felt as though I was in the room where it happened. MC Ninkuru Zinduru provided much needed reminders throughout the show that nights showcasing the talent of trans and gender non-conforming people of colour are few and far between. Flowers seemed to be a pretty special experience for those both onstage and in the audience. This was a bittersweet realization for me, as I felt both honoured to have been a part of it, and crushed that such incredible performers have so few performance spaces that are truly theirs. I hope this show will act as a catalyst to encourage more shows like it to come about. It was also quite evident that the audience loved every minute of the show. They sang along when asked, uproariously agreed with everything the performers said and gave an extended standing ovation at the end of the show. The theme of the evening seemed to be acceptance and accessibility, which I thought was a beautiful way to start off the Pride Festival Weekend.